Blazing Berlioz The Damnation of Faust at the Barbican with Sir Simon Rattle, Bryan Hymel, Christopher Purves, Karen Cargill, Gabor Bretz, The London Symphony Orchestra, The London Symphony Chorus directed by Simon Halsey, Rattle's chorus master of choice for nearly 35 years. Towards the end, the Tiffin Boys' Choir, the Tiffin Girl's' Choir and Tiffin Children's Choir (choirmaster James Day) filed into the darkened auditorium to sing The Apotheosis of Marguerite, their voices pure and angelic, their faces shining. An astonishingly theatrical touch, but absolutely right. If Simon Rattle can achieve such excellence in the cramped confines of the Barbican Hall, imagine how Britain's cultural life would be transformed if a world class concert hall with state of the art facilities were built. The arts are central to the nation's economy and prestige. Britain cannot afford to slip. 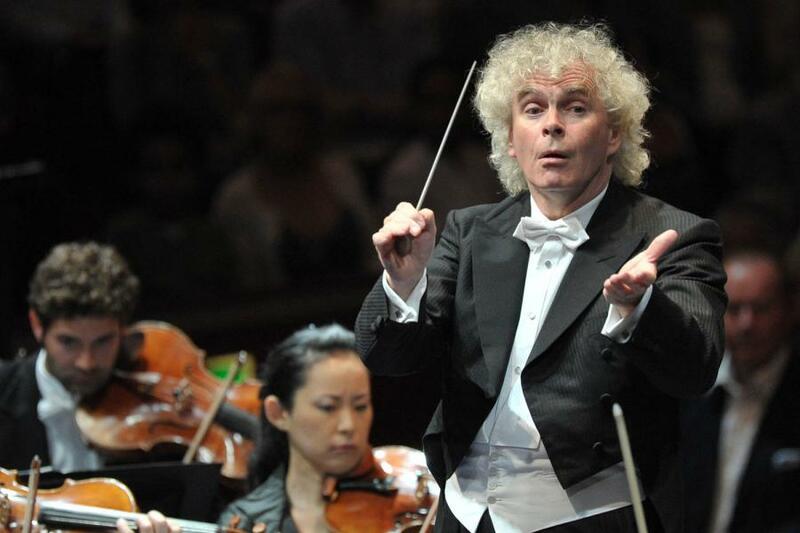 As Rattle has said, the London Symphony Orchestra have the potential to do a lot more repertoire, given the chance. Berlioz The Damnation of Faust is an extravagant work. The stage was crowded with performers, and the volume projected into the shoebox that is the Barbican Hall threatened at times to overwhelm. On the BBC Radio 3 re broadcast and on medici.tv the sound balance might be better, but the live experience was intoxicating, despite the acoustic. Wisely, Rattle held his forces back, emphasizing instead the intricate orchestration and textures that make this piece so exciting. It is a sprawling drama, whose theatrical effects are embedded in the music. In Berlioz's time audiences didn't need literal realism. They paid attention to the music. This performance was so vivid that the Barbican Hall seemed transformed as if by magic, as Berlioz's music came alive. Faust, the old scholar, watches peasants dancing in the countryside. "Tra la la , Haha ha!" sing the chorus. It is Easter. Spring has come. Nature blossoms. Christ has risen. Dare Faust dream of rejuvenation ? 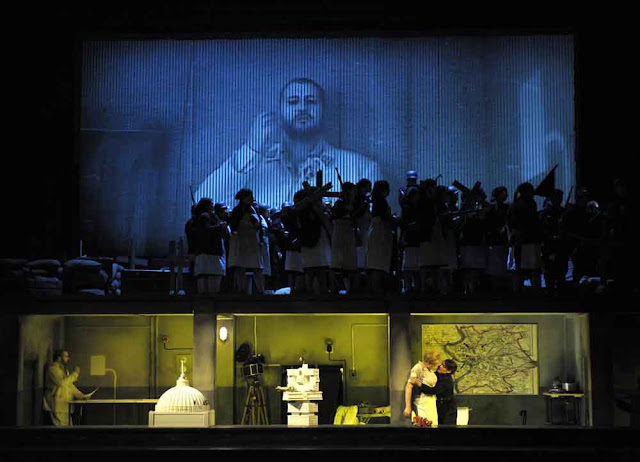 Bryan Hymel sang Faust, the rich, ringing warmth in his voice bringing colour to the role. Hymel then injected chill fear."Hélas! doux chants du ciel, pourquoi dans sa poussière Réveiller le maudit?". Faust is no fool : he already senses the immensity of what is to come. A Faust as strong as Hymel needs an equally singular Méphistophélès. Christopher Purves provided an authoritative counterbalance. The expressiveness in Hymel's voice contrasted with the authority in Purves's voice and his purposeful enunciation. The way Purves sang "Ô pure émotion!" showed how Méphistophélès had sized Faust up. A strong Brander, too, in Gabor Bretz. Though the part isn't big, it's important, for Brander is to the students what Méphistophélès is to Faust. The chorus sang lines that swayed from side to side, as drinkers do. But an undercurrent of violence runs through the merriment. Purves sings the Song of the Flea but the drunks think it's funny. In the Voici des roses, Purves suggested the thoughtful side of Méphistophélès. 's character: low winds and strings evoking melancholy. The devil is dangerous because he understands human sensitivity, and uses that to manipulate. Perhaps Méphistophélès. is a kind of Oberon, for Faust is lulled into a dream by a magical flute melody, later taken up by the strings, and the songs of gnomes and sylphs. A magical scene which owes much to Mendelssohn. For Faust, a reverie of love. For the students, mindless delusion as they march off to war. Hymel's aria "Merci, doux crépuscule! " was a star turn, beautifully articulated, glowing with feeling. The phrase "Que j’aime ce silence," glowed beautifully, followed by a deeply felt "et comme je respire Un air pur!" The orchestra responded in kind, with transparently delicate textures. When Méphistophélès. butts in, a violin plucks a banal ditty, like a student with a lute. But Faust is made of far finer stff, as is Marguerite. Karen Cargill sang the Song of the King of Thule .with sincerity. The song is a paean to fidelity, loyalty so strong it defies death. Garlanded by viola and cellos, it's anothe moment of "silence" where Méphistophélès and the world cannot reach. Berlioz's The Damnation of Faust owes as much to Shakespeatre as to Goethe. In the magical Evocation, fireflies dance, piccolos playing bright figures augmented by darker hued winds and strings. Textures as transparent as these need this kind of definition There was humour, too, in the trombones and tuba, which not every orchestra can carry off as well as the LSO. Purves curled his tongue around the final words, with the menace of a snake, for now Faust and Marguerite have their encounter. Hymel's "Ange adoré" glowed resplendently, and his cry "Marguerite est à moi!." scaled the heights. But the world intrudes, After fast paced exchanges, the lovers are torn apart. The cross currents between soloists, choirs and orchestra were very well defined. Then, back to solitude. Cargill's Romance showed her at her finest. matched by evocative oboe accompaniment. Although some incarnations of Faust emphasize the God/Devil angles in the legend, Berlioz was very much a Romantic, for whom Nature was an alternative diety. Thus the importance of the Invocation. Hymel sang the aria Nature immense, impénétrable et fière, with such fervour it seemed an act of faith. But Fast is doomed. Méphistophélès and Faust set off on horses that fly through the sky, defying the laws of Nature. Wailing woodwinds, and a frenzied pace in the orchestra, tensely plucked pizzicato. The children's voices screamed "Ah!" and the tubas wailed pounding staccato, Now, Méphistophélès has little need for formal language. "Hop ! Hop!" screamed Purves. My flesh creeped, thinking of the "Hop Hop" at the end of Wozzeck. The men's chorus walked on stage, among the orchestra, singing their demonic chorus : skat lyrics before the term was invented, interspersed with machine-gun staccato. Are the demons the students and soldiers? "Hosana !" sang the choirs at the back of the stage. Harps sggested angels, and the palpitating, ascending rhythms, the flapping of wings, or the image of water (as opposed to the fires of hell) And then the children's choirs filed into the auditorium, illuminating the darkness with their high, pure voices. Like a miracle !